The tangibility of numbers makes them an ideal tool for marketing. Telling drivers to slow down isn’t nearly as vivid as telling them that “55 saves lives,” (though we later learned that 65 m.p.h. apparently saves lives just as well). Football fans have probably seen ads for the NFL’s “Play 60” campaign that encourages children to get a daily hour of exercise, and there is a similar program for K-5 teachers and their students called “Take 10.” Numerous other examples abound. Not surprisingly, climate change activists have discovered the allure of numbers, too. A recent worldwide demonstration highlighted the number 350, as in parts per million of carbon dioxide. The idea is that higher concentrations of carbon dioxide in the atmosphere might produce catastrophic consequences. Organized through the website 350.org, more than 4,000 demonstrations displayed the number using chunks of ice in Greenland, sandbags placed by American soldiers in Afghanistan, or just by waving signs and flags, all of them “saying one thing very loudly, and very beautifully,” according to 350.org founder Bill McKibben. 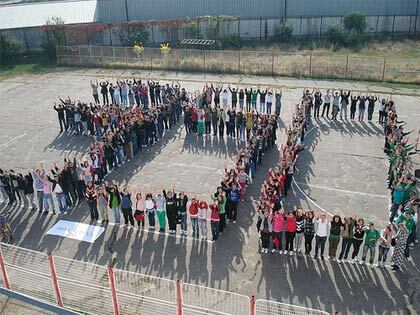 Romanian students join 350.org's worldwide demonstration in October. A second climate-related campaign with a numerical angle,10:10.org, was also recently in the news when the major British musical festivals Lovebox (in London) and Bestival (on the Isle of Wight) announced they will both participate this year. The goal is to enlist businesses, organizations, and individuals to commit to reducing their carbon emissions by 10% in 2010, and the pledge by the two festivals, which last year drew close to 100,000 people between them, was seen as a major triumph by the movement’s organizers. The festivals hope to meet the 10% cuts through such measures as reducing the number of trucks they use, utilizing solar power and local biofuels to operate their stages, and providing incentives for attendees to take public transportation. Retro climate-change numerology...the latest Drive 55 bumper sticker. And to prove that good numbers are hard to forget, even driving 55 has made a comeback—this time in the name of environmentalism.